As at the teams’ old venue, the seating bowl rings the entire stadium. New York City is the only town in the U.S.A. with more than one National Football League team. It has two: the New York Giants of the National Football Conference and the New York Jets of the American Football Conference. For more than 20 years, these gridiron superheroes coexisted more or less contentedly in the same facility—the 80,000-seat Giants Stadium (1976), which sat until very recently in the Meadowlands Sports Complex in East Rutherford, New Jersey. A section through the New Meadowlands stadium showing aluminum louvers as lightshades and cladding. It was more or less a happy arrangement because the stadium had been designed specifically for the Giants, featuring their colors in the seating, their heraldry on the walls of the concourses, and their old-school spirit in the utilitarian architecture. The Jets, who moved onto this hallowed ground in 1984 after fleeing an even less advantageous arrangement at Shea Stadium in Queens—where they toiled under the thumb of Major League Baseball’s Mets—never really got to feel that they were in their element, never truly knew what it meant to play a home game. After several aborted attempts at getting their own digs—including the ill-fated West Side Stadium project—the Jets and the Giants came to an understanding. The two teams would join forces and build the best stadium in the league right there in the Meadowlands, a stadium that would meet their needs equally and put New York City—or rather, East Rutherford—in the running to host the Super Bowl. 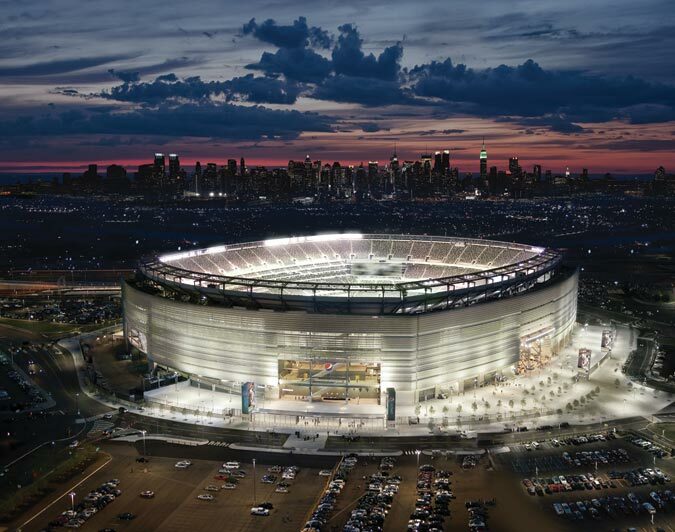 Design architect 360 Architecture, working with architect of record Ewing Cole, got the job of turning out a professional football venue—neutrally dubbed the New Meadowlands Stadium—that would embody the distinct personalities of both franchises. It was not an easy task. The teams had very different ideas about how a stadium should look and feel. The Giants, with their roots in the halcyon days of the leather helmet, favored a traditional aesthetic of exposed steel framework and muscular rusticated stone. The Jets, children of the go-go aerospace 1960s, rooted for a sleek metal-and-glass modernism. The designers gave them both. Referring to the column/tower dynamic of many of Manhattan’s skyscrapers, the base of the stadium’s facade is clad in heavy stonework up to about 20 feet above grade. From there, up to just below the apex of the seating bowl, a system of aluminum louvers and glass takes over. While this may seem a jarring transition, the light gray color of the stone blends closely with the anodized aluminum louvers and establishes the neutral palette of the interior. The walls, the floors, the ceilings, and the seating are all gray. The transition between each team’s home games is handled through the use of some 4,000 square feet of LED displays and a color-changing lighting control system, which can personalize the stadium for the Jets or Giants—green or red and blue—at the push of a button. This change will be most apparent on the exterior, where colored light will wash the facade in each team’s color from Sunday to Sunday. The field is similarly easy to switch. In the old venue, the end zones had to be repainted with each team’s logo before a game. Here, the artificial turf field features palletized end zones, which can be lifted out and swapped with a minimum of hassle. The entire transformation can be effected in 24 hours, a vast improvement over the former field, which took a week to prepare. With 82,500 seats, the new stadium does not vastly expand in capacity. It is, however, a much larger building—2.1 million square feet vs. the old 900,000. Most of this extra space is devoted to wider concourses for more concessions, a total of four locker rooms—one for each home team and two for visitors—and, most notably, 200 luxury suites arranged in three tiers at the sidelines. (Bruce Mau Design and Rockwell Group contributed to the new stadium’s design.) The average fan has it better, too. Four massive scoreboards, each measuring 30 feet high by 118 feet long, occupy the corners of the bowl, ensuring that no one will miss the slow-motion crunch of an instant replay. 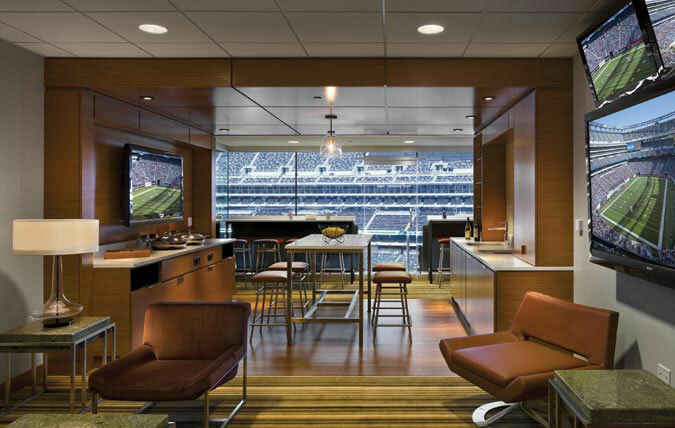 One of twenty luxury suites (left), and lounge space (right) inside the New Meadowlands stadium. 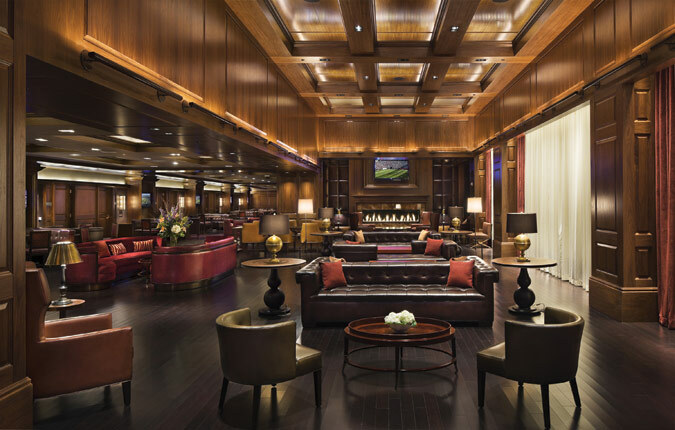 On one aspect both teams agreed: the need to impress upon visitors that they are in New York. There was also the desire to create the best sightlines in the business, allowing every fan to see the full arc of a 90-foot punt. Accommodating these requests required compromise. The bowl had to be raked back a bit to eliminate overhangs from the upper decks that would impede views. However, as in the old stadium, the seating bowl rings the entire stadium without a break. Many football stadiums feature open corners to allow views to skylines, a civic-minded gesture that dissipates the sounds of the crowd. At New Meadowlands this noise is very much bottled up, allowing a real big-city uproar to accumulate and let the visiting team know what they’re up against.